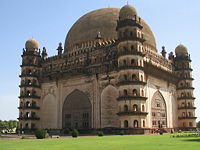 The Deccan sultanates refer to five Muslim-ruled late medieval kingdoms–-Bijapur, Golkonda, Ahmadnagar, Bidar, and Berar of south-central India. The Deccan sultanates located on the Deccan Plateau, between the Krishna River and the Vindhya Range. 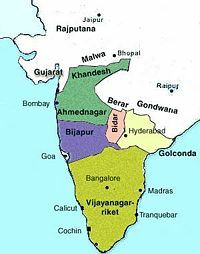 They had become independent states during the breakup of the Bahmani Sultanate: Bijapur, Ahmadnagar, and Berar in 1490, Bidar in 1492, and Golkonda in 1512. In 1510, Bijapur repulsed an invasion by the Portuguese against the city of Goa, but lost it later that year. Although generally rivals, they allied against the Vijayanagara empire in 1565, permanently weakening Vijayanagar in the Battle of Talikota. In 1574, after a coup in Berar, Ahmadnagar invaded and conquered Berar. In 1619, Bijapur annexed Bidar. The Mughal Empire later conquered the sultanates, stripping Berar from Ahmadnagar in 1596, taking Ahmadnagar completely between 1616 and 1636, and Aurangzeb's 1686-1687 campaign conquered Golkonda and Bijapur. As in the north, they left a rich legacy of architecture, literature, and art in the southern region of India. As with the Muslims in the north, the Deccan sultanates' rich legacy of culture helped shape India today. 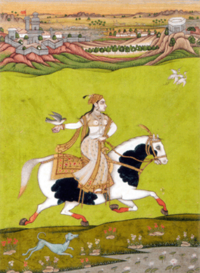 Chand Bibi, an eighteenth century painting. Malik Ahmed Shah Bahri, after defeating the Bahmani army led by general Jahangir Khan on May 28, 1490, declared independence and established the Nizam Shahi dynasty of Ahmadnagar or Ahmadnagar sultanate. The territory of the sultanate situated in the northwestern Deccan, between the sultanates of Gujarat and Bijapur. Initially Junnar served as his capital. In 1494, Bahri laid the foundation for the new capital Ahmadnagar. Malik Ahmed Shah, after several attempts, secured the great fortress of Daulatabad in 1499. Murtaza Shah annexed Berar in 1574. Chand Bibi, as a regent of Bahadur, Shah Mughal bravely repulsed an attack led by Murad in 1596. After the death of Chand Bibi in 1599, Ahmadnagar was conquered and Bahadur Shah imprisoned. But Malik Ambar and other Ahmadnagar officials defied the Mughals and declared Murtaza Shah II as sultan in 1600, at a new capital Paranda. Later, the capital shifted first to Junnar and then to a new city Khadki (later Aurangabad). In 1636 Aurangzeb, then Mughal viceroy of Deccan finally annexed the sultanate to the Mughal empire. 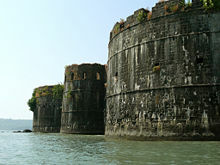 Janjira Fort in the Bijapur sultanate. During the disintegration of Bahmani sultanate, Fath-ullah Imad-ul-Mulk, governor of Berar declared independence in 1490, and founded the Imad Shahi dynasty of Berar sultanate. He established the capital at Achalpur (Ellichpur). He also fortified Gavilgad and Narnala. His successor, Ala-ud-din, resisted the aggression of Ahmadnagar with the help from Bahadur Shah, sultan of Gujarat. The next ruler, Darya, tried to align with Bijapur to prevent aggression of Ahamdnagar, but failed. 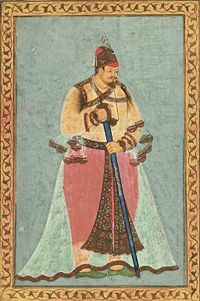 In 1574, Tufal Khan usurped Burhan Imad Shah, the last ruler of Imad Shahi dynasty and in the same year Mutaza I , sultan of Ahmadnagar annexed it to his sultanate. Qasim Barid, founder of Barid Shahi dynasty joined the service of Bahmani ruler Mahmud Shah as a sar-naubat but later became mir-jumla of the Bahmani sultanate. In 1492, he declared independence and curved out Bidar sultanate. Bidar stood as the smallest of the five Deccan sultanates. The last ruler of the Bidar, sulatante Amir Barid Shah III, fell in 1619, and Bijapur Sultanate annexed the sultanate. The Adil Shahi dynasty ruled the Bijapur sultanate from 1490 to 1686. The Adil Shahis originally reined as provincial rulers of the Bahmani Sultanate. But with the breakup of the Bahmani state after 1518, Ismail Adil Shah established an independent sultanate, one of the five Deccan sultanates. The Bijapur sultanate, located in southwestern India, straddling the Western Ghats range of southern Maharashtra and northern Karnataka. Ismail Adil Shah and his successors embellished the capital at Bijapur with numerous monuments. The Adil Shahis fought the empire of Vijayanagar, which lay to the south across the Tungabhadra River, and fought the other sultanates as well. The sultanates combined forces to deliver a decisive defeat to Vijayanagar in 1565, after which the empire broke up. Bijapur seized control of the Raichur Doab from Vijayanagar. In 1619, the Adil Shahis conquered the neighboring sultanate of Bidar, incorporating it into their realm. In the seventeenth century, the Marathas revolted successfully under Shivaji's leadership and captured major parts of the Sultanate except Bijapur. Aurangzeb conquered the weakened Sultanate in 1686 with the fall of Bijapur, bringing the dynasty to an end. The Qutb Shahi dynasty stood as the ruling family of the sultanate of Golkonda in southern India. Shia Muslims, they belonged to a Turkmen tribe from the Turkmenistan-Armenia region. The dynasty's founder, Sultan Quli Qutub-ul-Mulk, migrated to Delhi with some of his relatives and friends in the beginning of the sixteenth century. Later, he migrated south to Deccan and served Bahmani sultan Mohammad Shah. 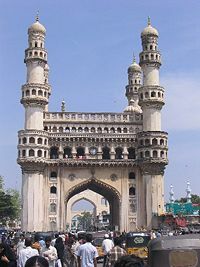 He conquered Golkonda and became the Governor of Telangana region in 1518, after the disintegration of the Bahmani sultanate into the five Deccan sultanates. Soon after, he declared independence from the Bahmani sultanate, took title Qutb Shah, and established Qutb Shahi dynasty of Golconda. The dynasty ruled for 171 years, until the Mughal emperor Aurangzeb's army conquered Golkonda in 1687. Abul Hasan Qutb Shah 1672-1687. 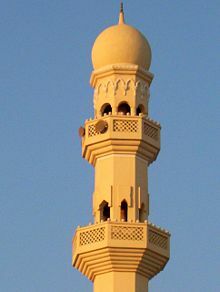 Minaret of Masjid Abu Bakr on Exhibition Ave in Hoora. The bulbous ogee top recalls the architecture of the Muslim Deccan sultanates in South India. The rulers of five Deccan sultanates had a number of cultural contributions to their credit in the fields of art, music, literature and architecture. The development of Dakhani language stands out as an important cultural contribution of the Deccan sultanates. Dakhani, which started growing under the Bahamani rulers, developed into an independent spoken and literary language during that period by continuously drawing resources from Arabic-Persian, Marathi, Kannada and Telugu. The language later became known as Dakhani Urdu to distinguish it from the North Indian Urdu. The Deccani miniature painting, which flourished in the courts of Ahmadnagar, Bijapur, and Golkonda constitutes another major cultural contribution of the Deccan Sultanates. The architectural splendors of Deccan like Char Minar and Gol Gumbaz belong to the period. The religious tolerance displayed by the Nizam Shahi, Adil Shahi, and Qutb Shahi rulers also merit mention. The Nizam Shahi rulers of Ahmadnagar enthusiastically patronized miniature painting. The earliest surviving paintings took the form of illustrations of a manuscript Tarif-i-Hussain Shahi (c. 1565), housed in Bharata Itihasa Samshodhaka Mandala, Pune. The Bibliothéque Nationale of Paris displays a miniature painting of Murtaza Nizam Shah (c. 1575) while State Library, Rampur displays another one. Three other paintings, the Running Elephant in an American private collection, the Royal Picnic in the India Office Library, London, and the Young Prince Embraced by a Small Girl in the Edwin Binney 3rd collection in the San Diego Museum most probably belong to the period of Burhan Nizam Shah II. Among the monuments of Nizam Shahi rulers in Ahmednagar, the tomb of Ahmad Shah I Bahri (1509) at the center of Bagh Rouza, a garden complex had been the earliest one. The Jami Masjid also belong to the same period. Mecca Masjid, built in 1525, by Rumi Khan, a Turkish artillery officer of Burhan Nizam Shah I has originality in its design. The Kotla complex constructed in 1537 as a religious educational institution. The impressive Farah Bagh stood the centerpiece of a huge palatial complex completed in 1583. The other monuments in Ahmednagar of the Nizam Shahi period are Do Boti Chira (tomb of Sharja Khan, 1562), Damri Masjid (1568), and the tomb of Rumi Khan (1568). The Jami Masjid (1615) in Khirki (Aurangabad) and the Chini Mahal inside the Daulatabad fort had been constructed during the late Nizam Shahi period (1600–1636). The tomb of Malik Ambar in Khuldabad (1626) represents another impressive monument of that period. The Kali Masjid of Jalna (1578) and the tomb of Dilawar Khan (1613) in Rajgurunagar also belong to the Nizam Shahi period. The Barid Shahi rulers focused their architectural activities on garden tombs. The tomb of Ali Barid Shah (1577) represents the most notable monument in Bidar. The tomb consists of a lofty domed chamber, open on four sides located in the middle of a Persian four-square garden. The Rangin Mahal in Bidar, built during the reign of Ali Barid Shah constitutes a complete and exquisitely decorated courtly structure. Other important monuments in Bidar during that period include the tomb of Qasim II and Kali Masjid. An important class of metalwork known as Bidri originated from Bidar. Those metalworks used mainly black zinc, inlaid with designs of silver and brass and sometimes copper. The Adil Shahi rulers contributed greatly in the fields of art, architecture, literature and music. Bijapur developed into a cosmopolitan city, attracting many scholars, artists, musicians, and Sufi saints from Rome, Iran, Iraq, Turkey, and Turkestan. Persian artists of Adil Shahi court have left a rare treasure of miniature paintings, some well-preserved in Europe's museums. The earliest miniature paintings ascribe to the period of reign of Ali Adil Shah I. The paintings in the manuscript of Nuzum-ul-Ulum (Stars of Science) (1570), kept in Chester Beatty Library, Dublin, stand as the most significant of them. The manuscript consists about 400 miniature paintings. Two other illustrated manuscripts attributed to the period of Ali Adil Shah I include Jawahir-al Musiqat-i-Muhammadi in British Library which contains 48 paintings and a Marathi commentary of Sarangadeva’s Sangita-Ratnakara kept in City Palace Museum, Jaipur which contains four paintings. The maximum number of miniature paintings came down to us belong to the period of reign of Sultan Ibrahim Adil Shah II. Maulana Farrukh Hussain won renown as the most celebrated painter of his court. Bikaner Palace, Bodleian Library, Oxford, British Museum, London, Victoria, and Albert Museum, London, Muśee Guimet, Paris, Academy of Sciences, St. Petersberg and Napstrek Museum, Prague preserve the miniature paintings of the period. The Adil Shahi rulers published many literary works in Dakhani. Ibrahim Adil Shah II himself wrote a book of songs, Kitab-i-Nauras in Dakhani. That book contains a number of songs whose tunes set to different ragas and raginis. In his songs, he praised Hindu goddess Sarasvati along with the Prophet and Sufi saint Hazrat Khwaja Banda Nawaz Gesudaraz. He had a unique tambur (lute) known as Moti Khan in his possession. The famous Persian poet laureate Zuhuri served as his court poet. The Mushaira (poetic symposium), born in the Bijapur court, later traveled north. The Adil Shahi kings had been known for tolerance towards Hindus and non-interference in their religious matters. They employed Hindus to high posts, especially as the officers who deal with the accounts and the administration, since the documents pertaining to the both remained in Marathi. The fortified city of Golkonda stands out as one of the earliest architectural achievements of the Qutb Shahi dynasty. The Jami Masjid (1518) erected by Quli-Qutb-ul-Mulk, the tomb of Muhammad Quli Qutb Shah (1611), the tomb of Muhammad Qutb Shah (1626), and the mosque of Hayat Bakshi Begam (1666) represent the notable monuments in Golkonda. Muhammad Quli Qutb Shah decided to shift the capital to Hyderabad, 8 km east of Golkonda. Here, he constructed the most original monument in the Deccan, the Char Minar in the heart of the new city. That monument (completed in 1591) has four minarets of 56 meters height. The construction of the Mecca Masjid, located at the immediate south of Char Minar, started in 1617 during the reign of Muhammad Qutb Shah, finally completed construction in 1693. The other important monuments of that period include the Toli Masjid (1671) and the Jami Masjid at Gandikota. The Qutb Shahi rulers had been great patrons of literature and invited many scholars, poets, historians and Sufi saints from Iran to settle in their sultanate. The development of Dakhani language embodies the most important contribution of the Golkonda sultanate in the field of literature. Ibrahim Quli Qutb Shah patronized Telugu literature also. Muhammad Quli Qutb Shah had been not only a great patron of art and literature but also a poet of high order. He wrote in Dakhani, Persian and Telugu and left an extensive Diwan (volume) in Dakhani, known as Kulliyat-i-Mohammad Quli Qutb Shah. Apart from the praise of God and the Prophet, he also wrote on nature, love, and contemporary social life. Qutb Shahi rulers appointed Hindus in important administrative posts. Ibrahim Quli Qutb Shah appointed Murari Rao as Peshwa, second to only Mir Jumla (prime minister). ↑ 1.0 1.1 1.2 George Michell and Mark Zebrowski, Architecture and Art of the Deccan Sultanates, In The New Cambridge History of India (Cambridge University Press, Cambridge, 1999), 274. ↑ 2.0 2.1 Michell & Zebrowski, Architecture and Art of the Deccan Sultanates, 275. ↑ Michell & Zebrowski, Architecture and Art of the Deccan Sultanates, 145-151. ↑ Michell & Zebrowski, Architecture and Art of the Deccan Sultanates, 80-86. ↑ Michell & Zebrowski, Architecture and Art of the Deccan Sultanates, 77-80. ↑ Michell & Zebrowski, Architecture and Art of the Deccan Sultanates, 239-240. ↑ Michell & Zebrowski, Architecture and Art of the Deccan Sultanates, 41-47. ↑ Michell & Zebrowski, Architecture and Art of the Deccan Sultanates, 161-190. ↑ Michell & Zebrowski, Architecture and Art of the Deccan Sultanates, 41. ↑ Michell & Zebrowski, Architecture and Art of the Deccan Sultanates, 101-106. ↑ Michell & Zebrowski, Architecture and Art of the Deccan Sultanates, 191-210. Masterpieces of the Deccan Sultanates. Bombay: Marg Publications, 1988. OCLC 41382821. Michell, George, and Mark Zebrowski. The New Cambridge History of India. Architecture and Art of the Deccan Sultanates. Cambridge: Cambridge University Press, 1999. ISBN 0521563216. Speziale, Fabrizio. The Relation between Galenic Medicine and Sufism in India During the Delhi and Deccan Sultanates. East and West. 53(1)(2003): 149. ISSN 00128376. Architecture and Art of the Deccan Sultanates. This page was last modified on 8 November 2017, at 17:24.